Defence Minister Christopher Pyne has welcomed a major milestone for the $3.6 billion SEA 1180 Arafua Class Offshore Patrol Vessel program as the $95 billion naval shipbuilding plan gathers steam. Minister Pyne announced that the keel of the first Arafura Class Offshore Patrol Vessel has successfully been constructed on time and on budget, using more than 50 tonnes of Australian steel and assembled at ASC's Osborne Naval Shipyard in South Australia. "This represents the ongoing success story of the government’s $90 billion continuous shipbuilding endeavour in Australia," said Minister Pyne. SEA 1180 Phase 1 OPVs will replace and improve upon the capability delivered by the 13 Armidale Class Patrol Boats by acquiring 12 new vessels, which will be known as the Arafura Class when they enter service from 2022. The primary role of the OPV will be to undertake constabulary missions and the OPV will be the primary ADF asset for maritime patrol and response duties. A competitive evaluation process (CEP) commenced in late 2015 and concluded with the signing of a contract with Lürssen Australia on 31 January 2018. "ASC is working very well with Lürssen Australia to build the first two OPVs," Minister Pyne added. 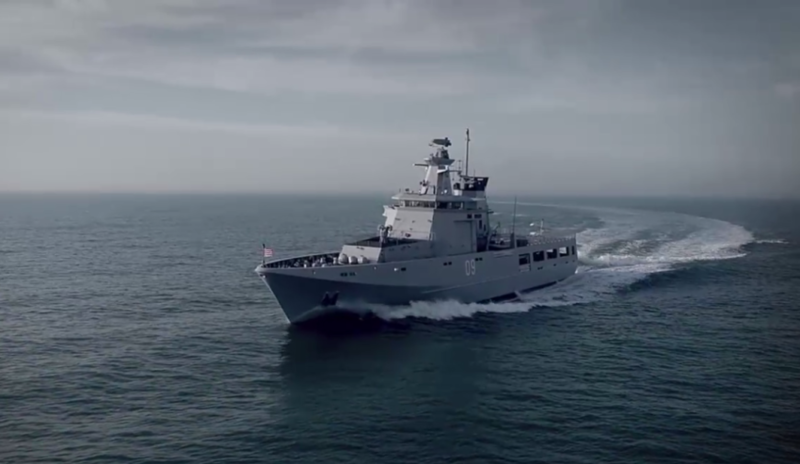 The project will move to Henderson in Western Australia in 2020 where 10 OPVs will be built by CIVMEC in partnership with Lürssen Australia. It’s estimated the $3.6 billion SEA 1180 project will create around 1,000 direct and indirect jobs. A ceremony to mark the keel laying of the first ship, HMAS Arafura, the lead ship in the Arafura Class, will be held soon after the blocks are structurally completed and moved to the fitting out facility. This milestone comes just four months following construction commencing at the South Australian shipyard, which was overseen by Minister Pyne, who said at the time, "The OPV project is expected to create up to 1,000 direct and indirect jobs. These new vessels are being built in Australian facilities, with Australian steel, and by Australian workers." ASC serves Australia's naval defence capabilities, with more than 2,500 employees across three facilities in SA and WA. ASC has evolved into Australia's largest specialised defence shipbuilding organisation, with naval design and engineering resources unparalleled within Australia's defence industry. Lürssen is a global leader in designing and building ships of the highest quality for demanding customers all over the world. Lürssen beat out bids from Dutch company Damen, which was also partnered with ASC and Civmec, as well as German company Fassmer, which was in a joint venture with Austal, for the SEA 1180 project. Civmec is an integrated, multi-disciplinary construction and engineering services provider to the oil and gas, metals and minerals, infrastructure, and marine and defence sectors. Headquartered in Henderson, WA, Civmec has regional offices in Broome (WA), Darwin (Northern Territory), Newcastle and Sydney (NSW), and Gladstone (Queensland).